Growing Learners, Leaders, and Lovers of Christ. Heritage Christian School is established as an independent private Christian school in Orange County to provide an excellent educational experience based on the authoritative and inerrant Word of God. The goal is to facilitate the development of the student spiritually, academically, physically, emotionally, and socially; All for the Glory of God. 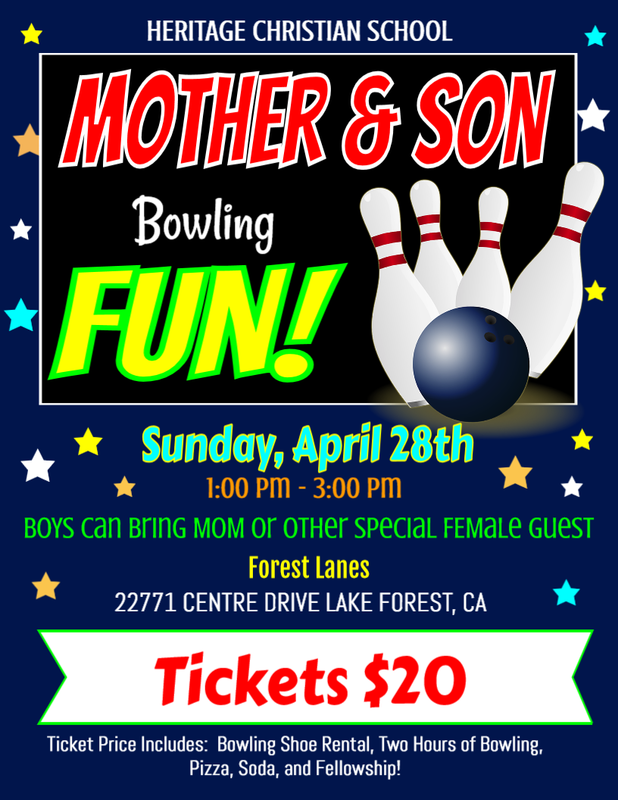 The Mother & Son Bowling Event is Here! Seeking to glorify God through Christ-centered teaching, academic excellence, and Christian service, all in a distinctly loving and nurturing environment. Heritage Christian School prepares student to be learners, leaders, and lovers of Christ. We are fully accredited through the Association of Christian Schools International (ACSI), as well as from the Western Association of Schools and Colleges (WASC).